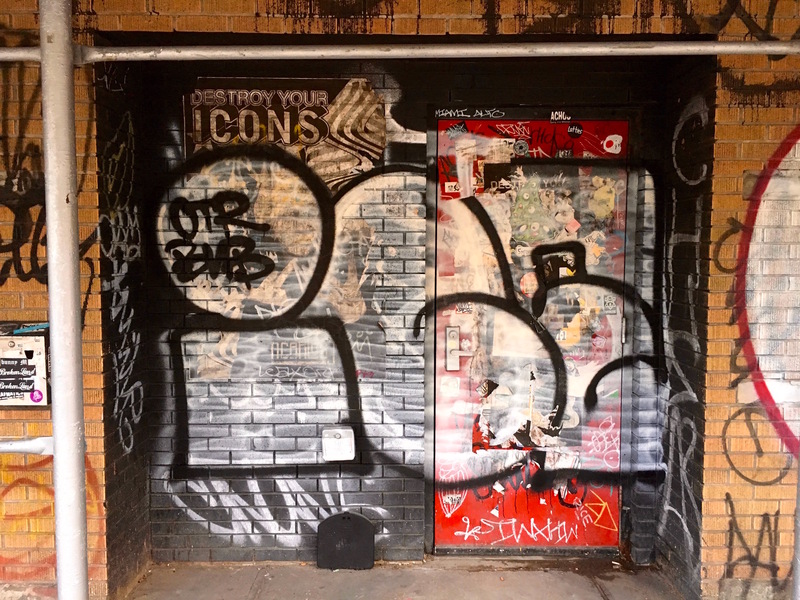 The remains of New York’s horse and wagon past are all over Gotham’s side streets and outer edges, where delivery companies often owned stables to house their working horses. 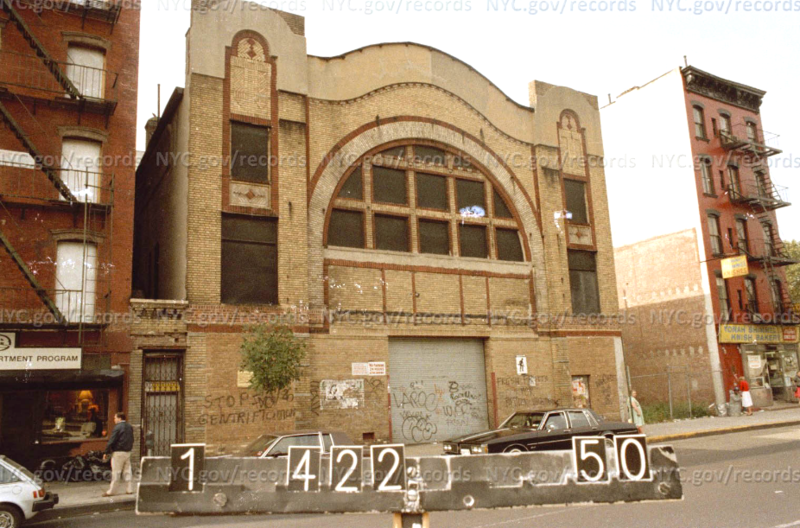 The far West Village still has many of the carriage houses and stables built in the neighborhood in the late 19th century, when the area was rougher and more working class. 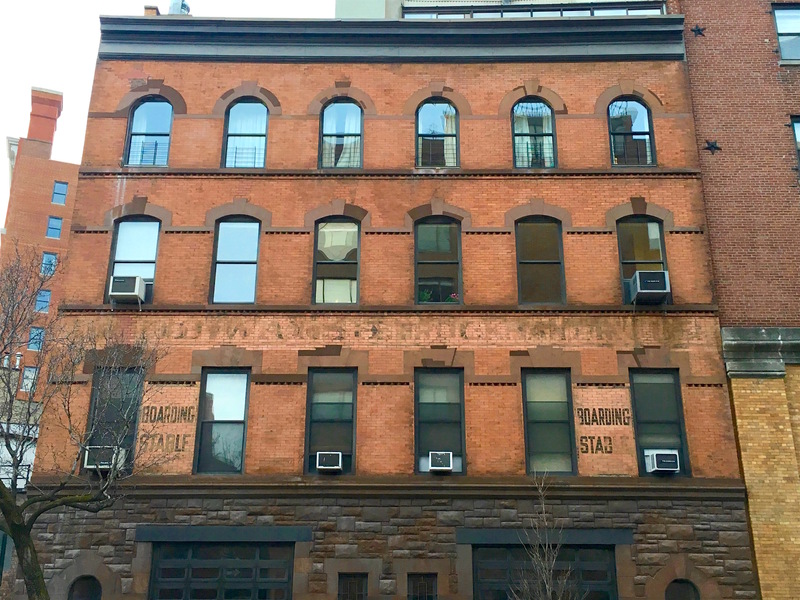 One lovely example is this red brick and stone stable, built in 1893 at 704-706 Greenwich Street. It was used by various delivery firms who relied on horses and wagons (and later trucks) to pick up and drop off goods. 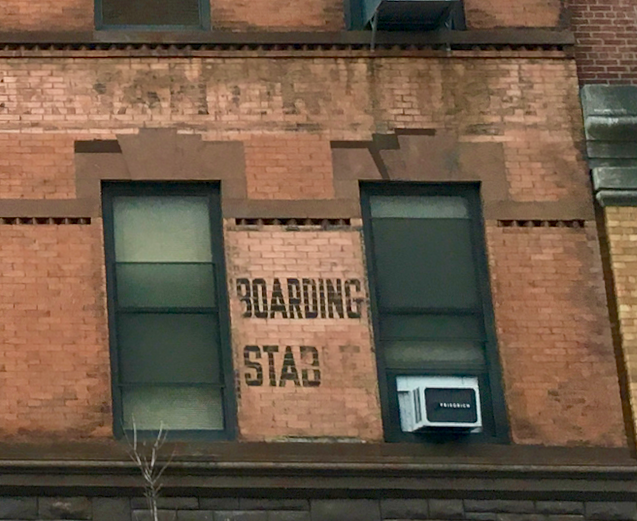 The “Boarding Stables” signs have faired pretty well over the decades. 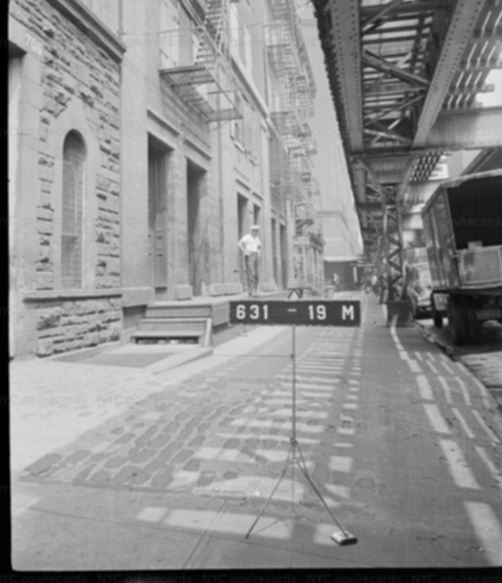 It’s right at eye level for riders of the Ninth Avenue elevated, which used to run up Greenwich Street (below on the left side of the photo, in 1940). 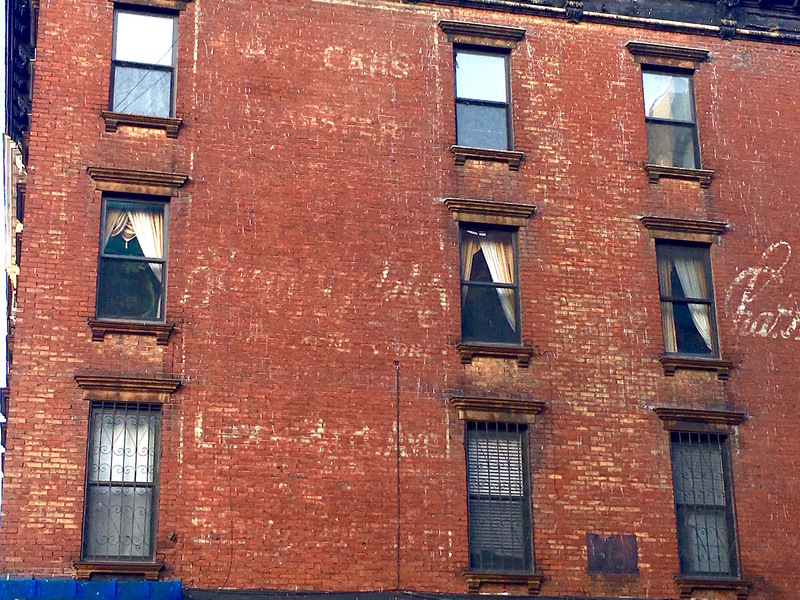 But the letters across the facade of the building (now apartments) are too faded for me to make sense of. Is “Greenwich” the word on the left? 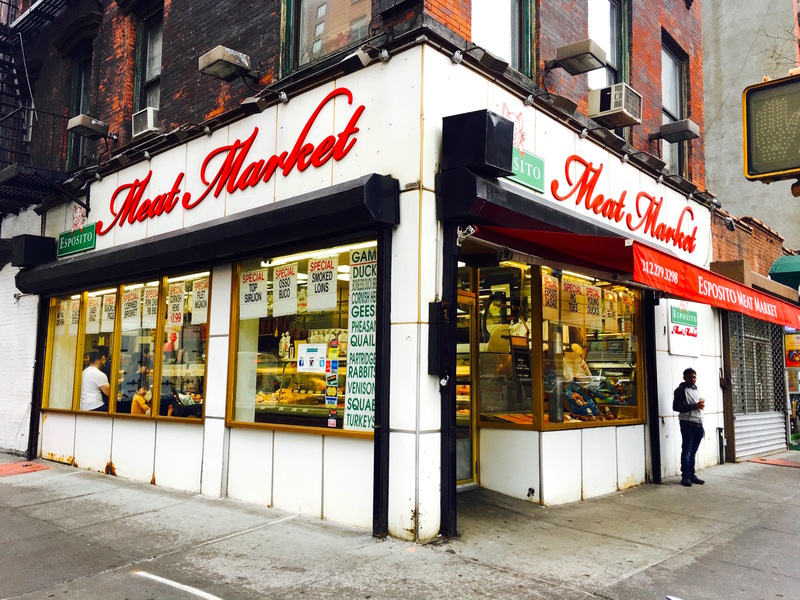 You don’t have to be a meat eater to appreciate the old-style store signs at Esposito, a meat market at Ninth Avenue and 38th Street that’s been making sausage and selling cold cuts since 1932. 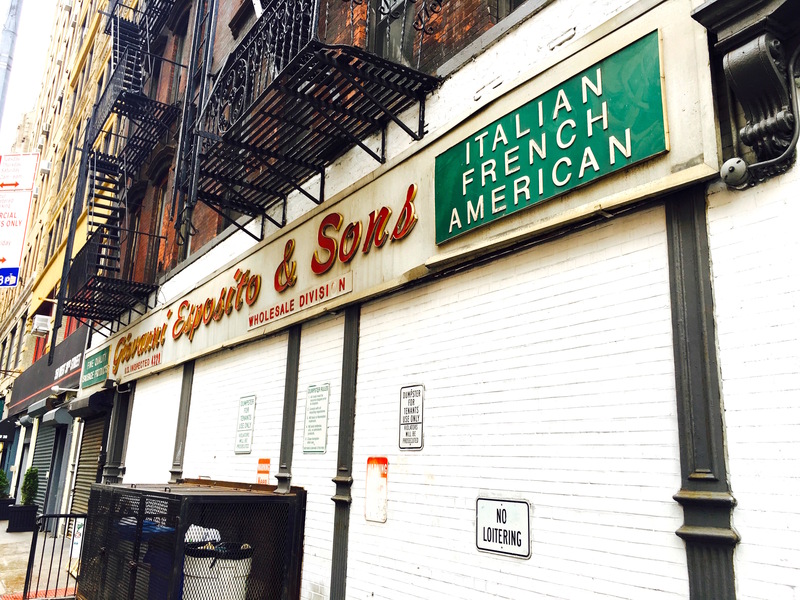 Yet there’s something a little unusual on the wholesale “Giovanni Esposito & Sons” sign down a bit on 38th Street. I’ve seen similar store signs at other Italian specialty food shops that advertise “Italian” and “American.” But I’ve never seen one that added “French” to it! New York boasts plenty of trendy, pricey steakhouses. 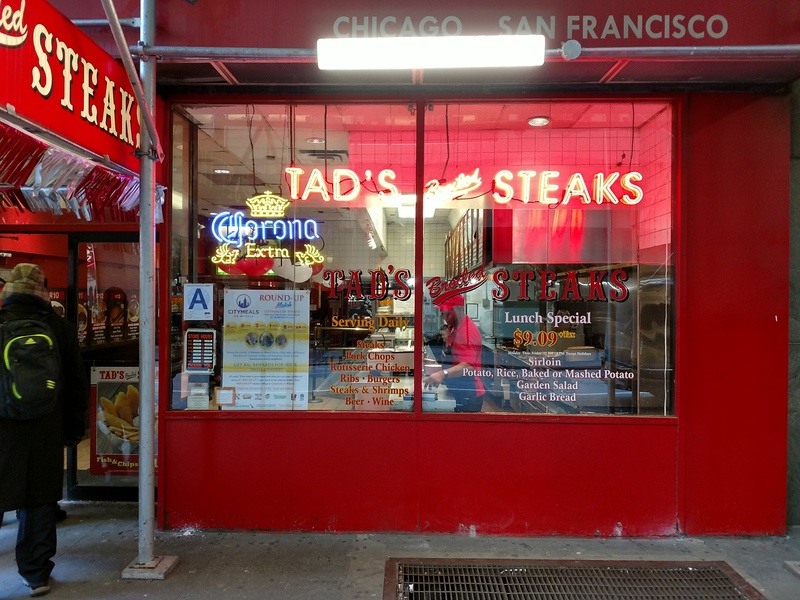 But it’s been a long time since the city has had room for a cut-rate chophouse chain like Tad’s. 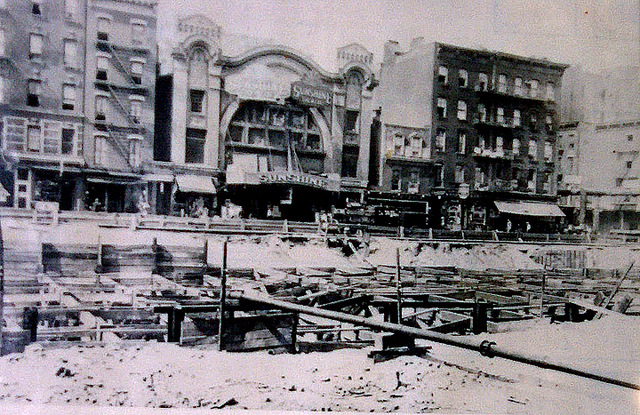 Times Square had a few (at left); one stood at Seventh Avenue and 34th Street too. 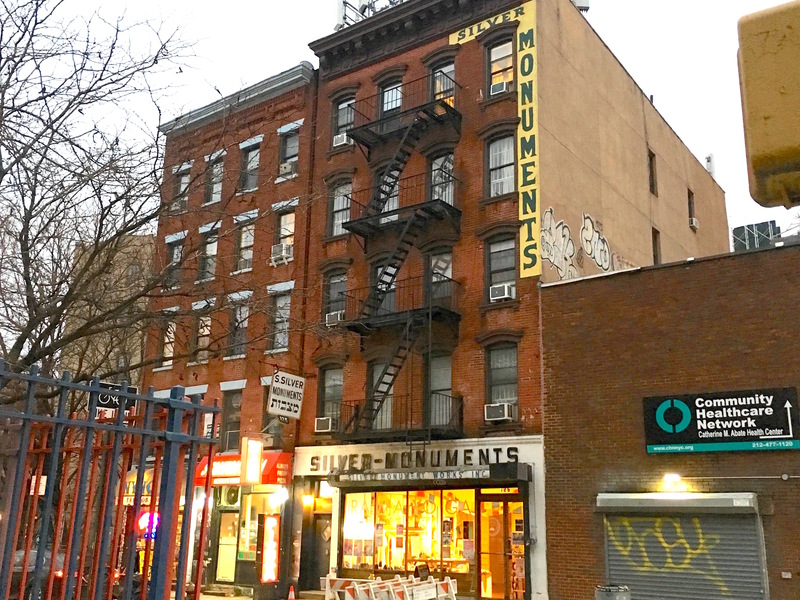 I recall another on East 14th Street just east of Union Square, which I think limped along after the Palladium closed and finally became a pizza parlor in the 1990s. 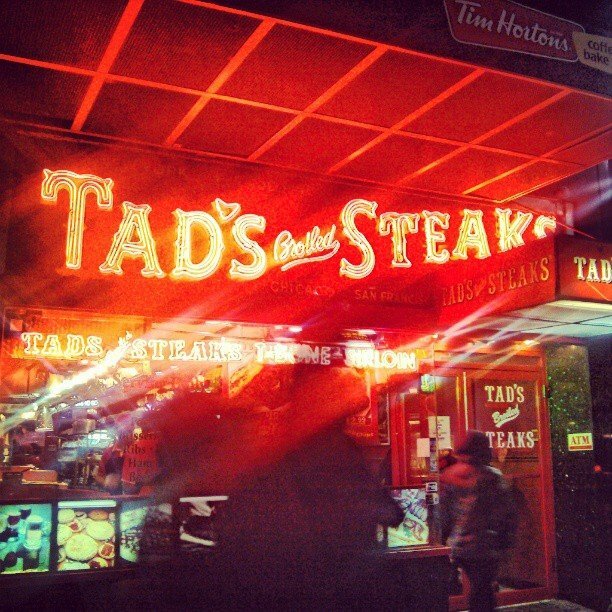 Now, only one Tad’s remains. 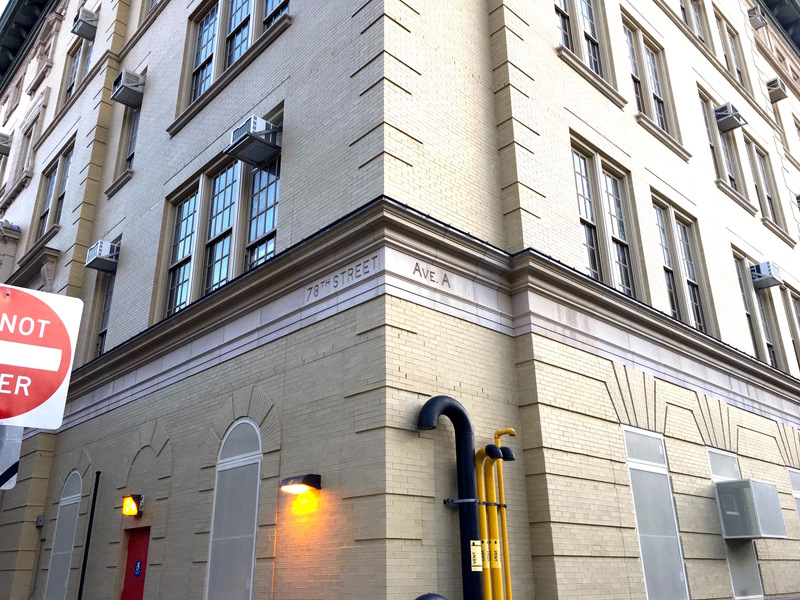 It’s in the Theater District on Seventh Avenue and 50th Street (below). 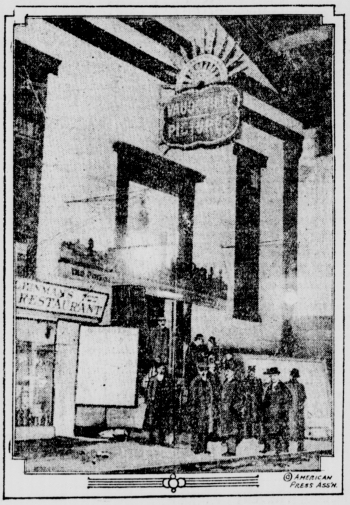 The setup is basically the same as it was in 1957, when a North Dakota native named Donald Townsend opened the first Tad’s. He charged $1.09 for a broiled T-bone, baked potato, salad, and garlic bread, recalled the New York Times in 2000 in Townsend’s obituary. “Little matter that the meat might be cardboard thin, with clumps of fat and sinew,” stated the Times. 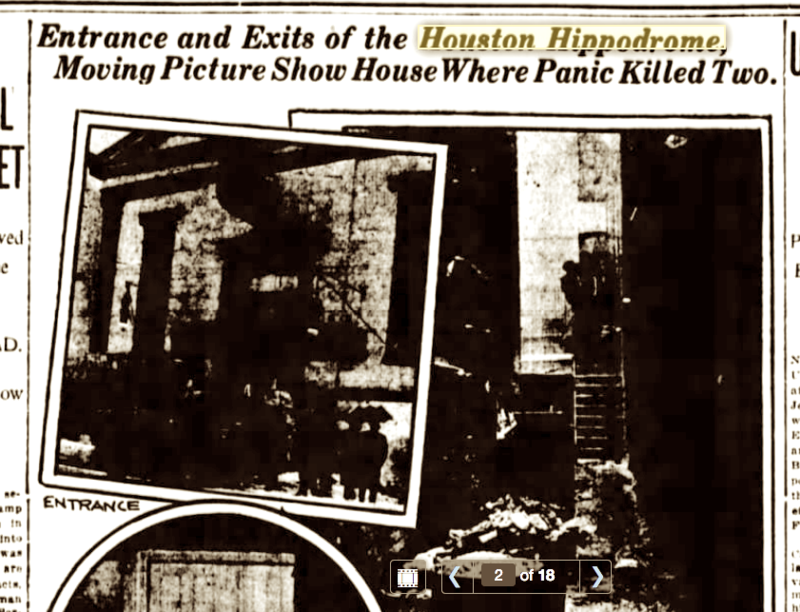 “For a tenth the price of a fancy steak dinner, a working man could watch his hunk of steer searing under leaping, hissing flames in Tad’s front window—’a steak show” in Mr. Townsend’s memorable phrase. That broiled steak dinner now runs $9.09. 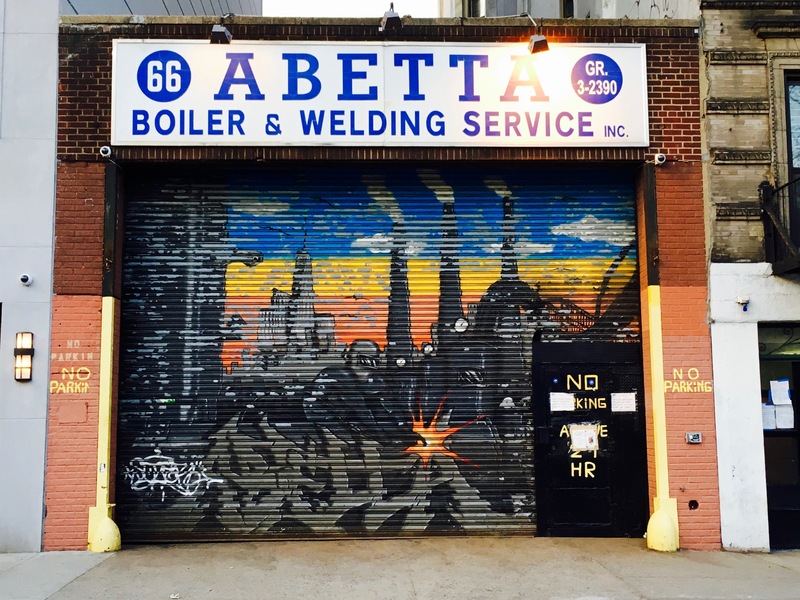 But the cafeteria-style meal is still a bargain if you’re looking for an old-school New York experience or miss the city’s once ubiquitous mini-franchises, like Chock Full O’ Nuts or Schrafft’s. 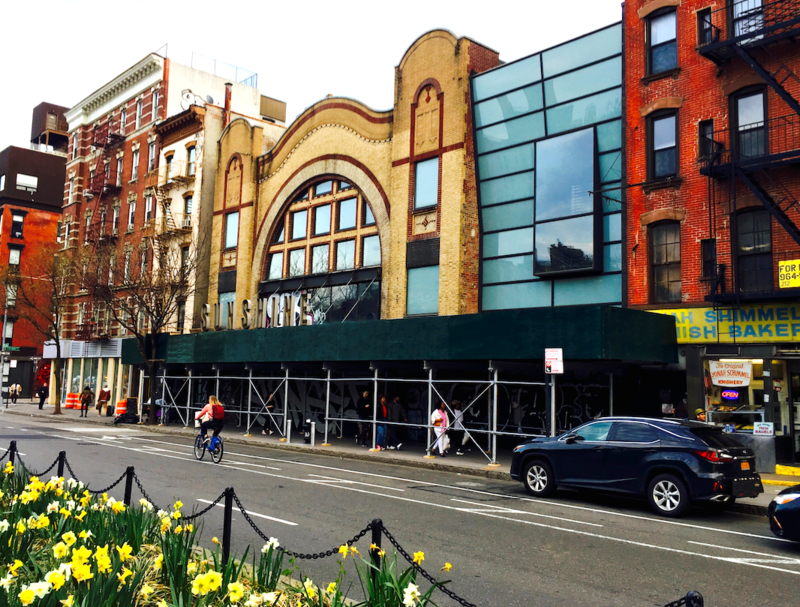 There’s a handsome building on Lexington Avenue at 73rd Street built in the late 1890s with a ground floor now hidden behind scaffolding. 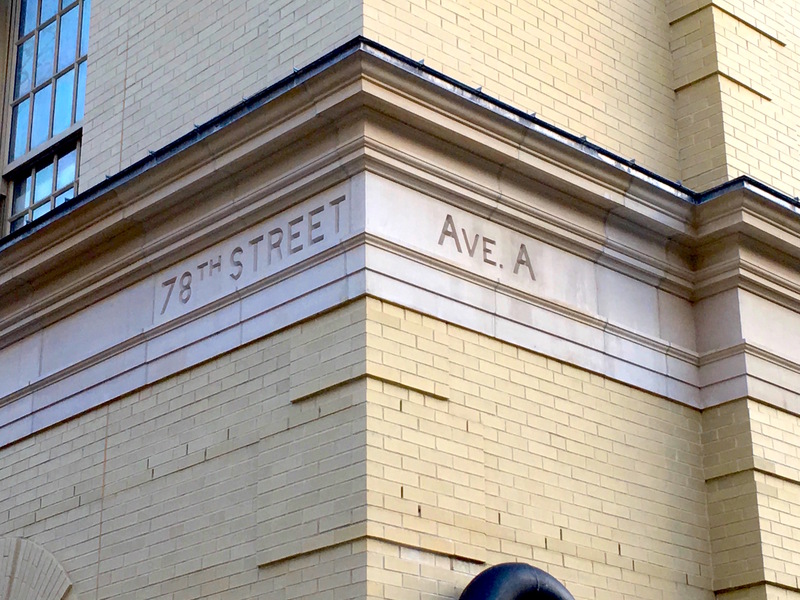 That’s bad news for the retailers trying to attract street traffic along this slender retail stretch of Lenox Hill. 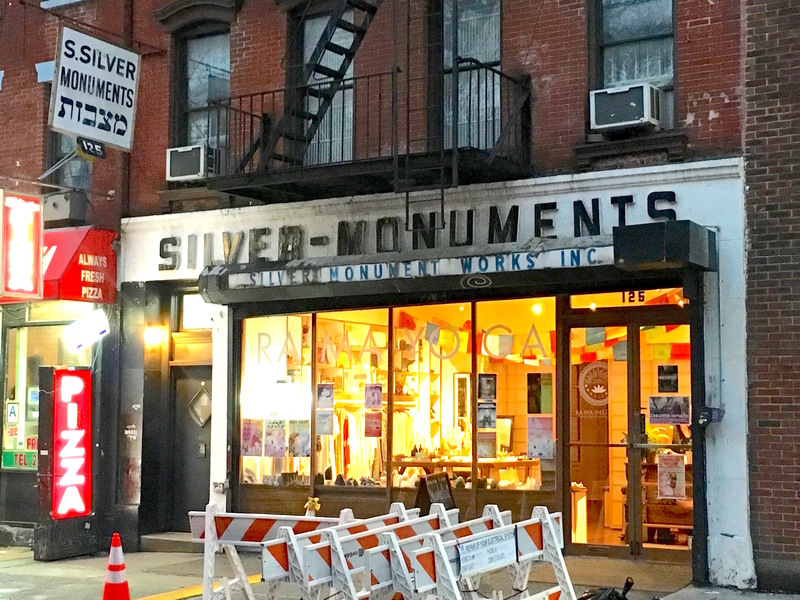 But it’s good news to fans of old New York store signs, which often reemerge from behind newer signage during construction. 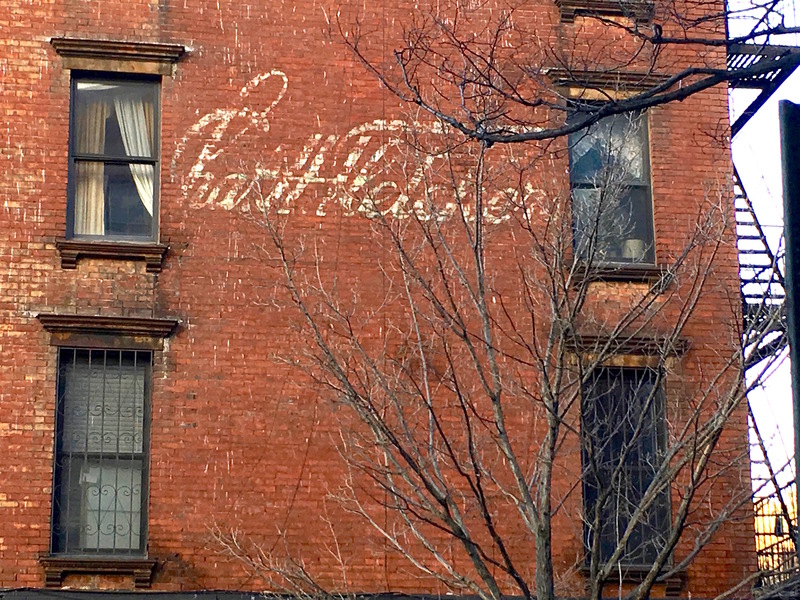 “Custom made,” another painted window sign tells us, hard to see behind the building’s decorative storefront. 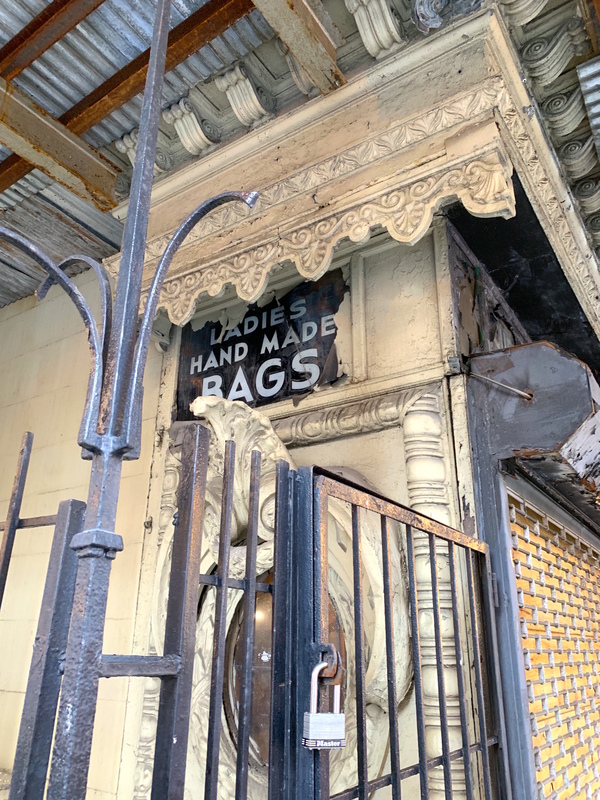 How far back does this long-gone bag store date to? 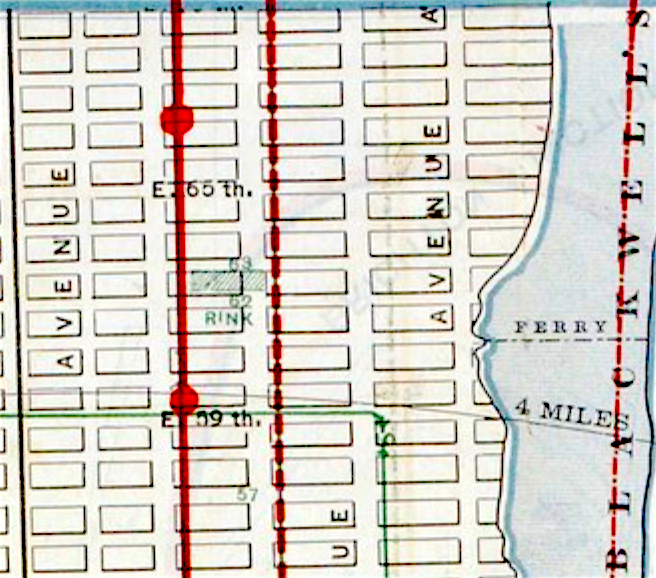 Here it is in a 1940 tax photo from the online gallery of the New York City Municipal Archives. 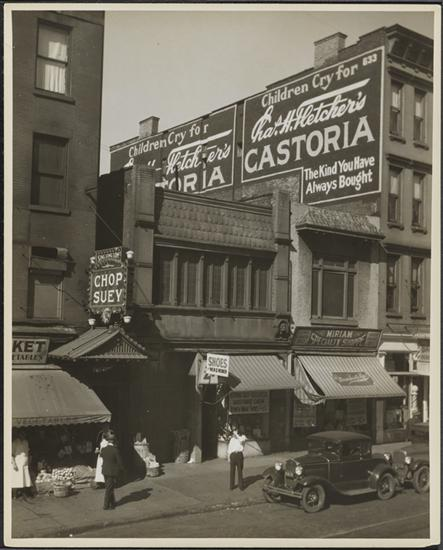 It’s not the best image, but you can make out the same signage that’s at this corner store today, spotted by Ephemeral reader Robert C. Thanks for sending it in! 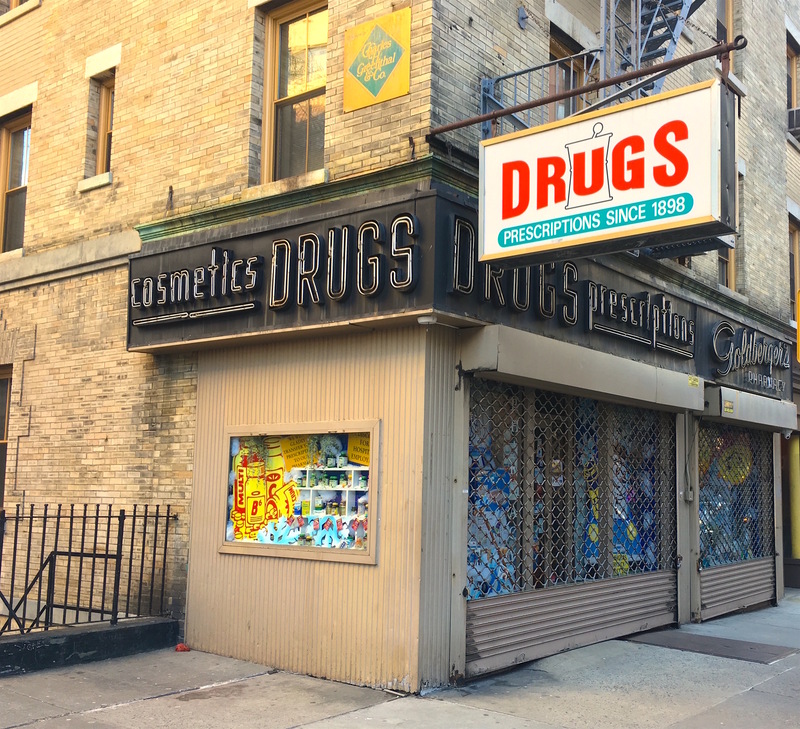 Neon signs, decorative mortar and pestles, brass chandeliers, wood shelves with sliding ladders…there’s a lot to love about New York’s longtime independent pharmacies. 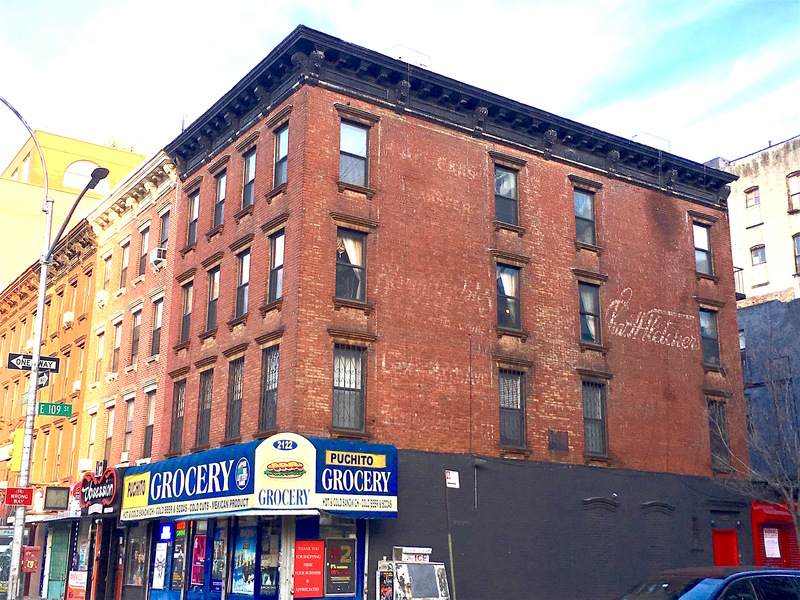 Many of these corner stores have been in business for over a century, yet have somehow resisted getting steamrolled by Duane Reade. 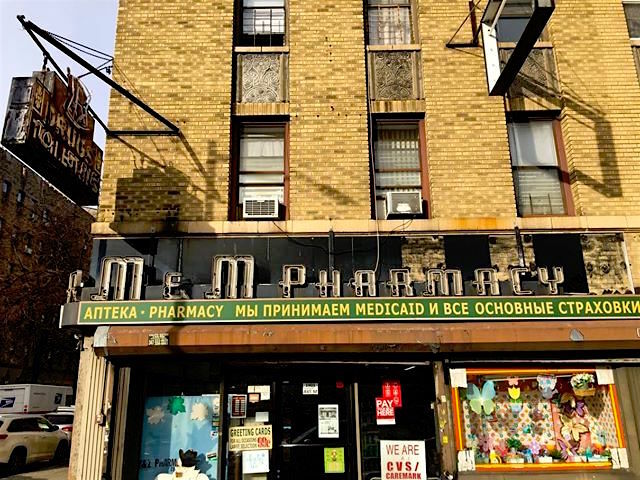 I don’t know how long M&M Pharmacy has been on Avenue M and East 19th Street in Midwood. 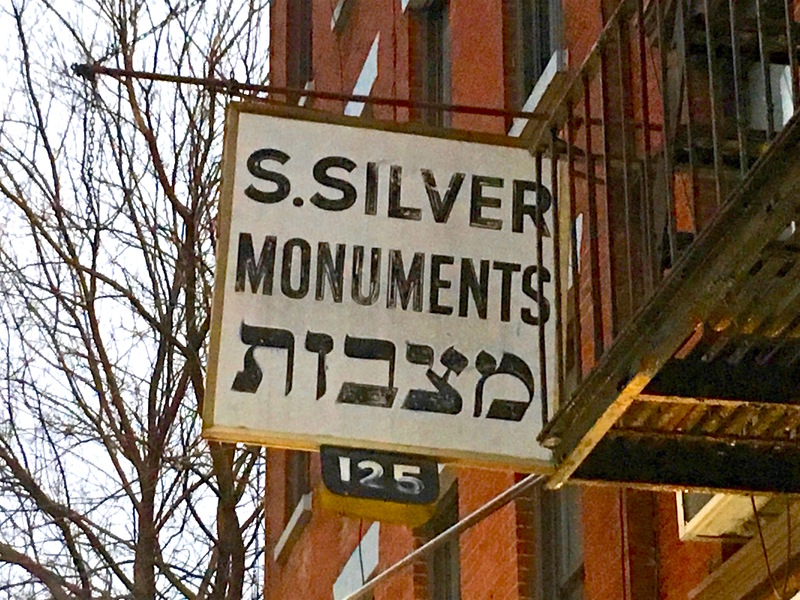 But the signage, at least, dates to the 1940s. 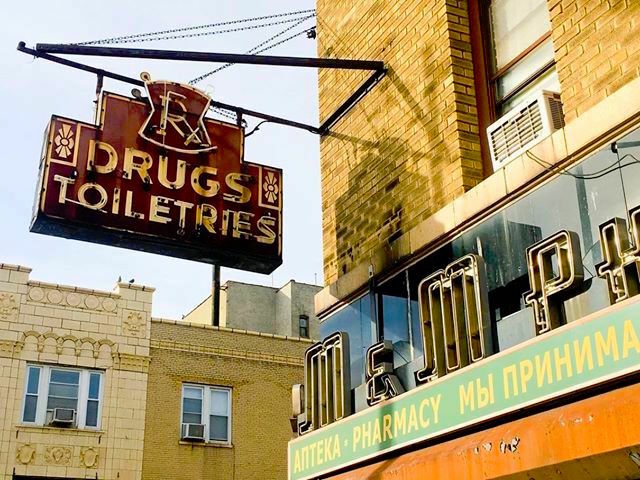 The corner neon sign with the Rx is a wonderful relic—and when was the last time you saw the word “toiletries” on a store sign? The English lettering on M&M’s weathered neon sign looks very 1940s (the Cyrillic script, clearly, is not quite as old). 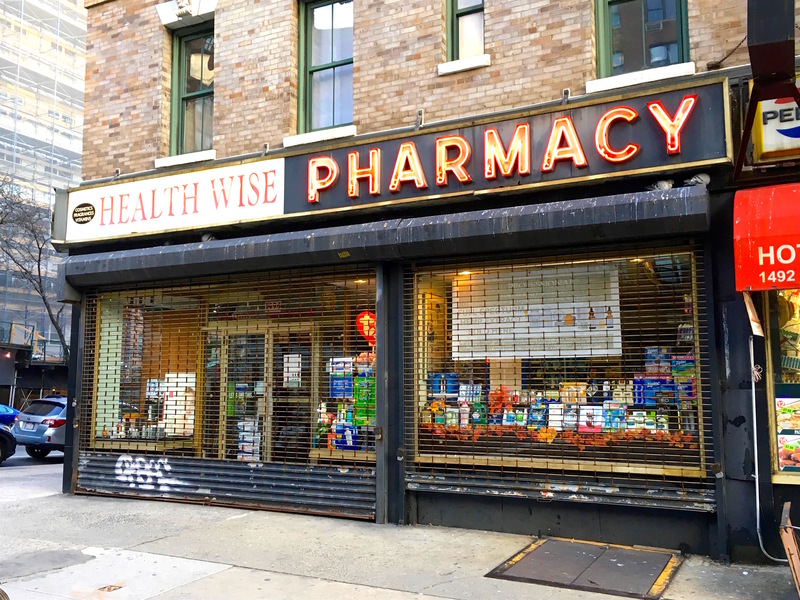 Another old-school corner drugstore that caught my eye is Health Wise, on York Avenue and 79th Street. 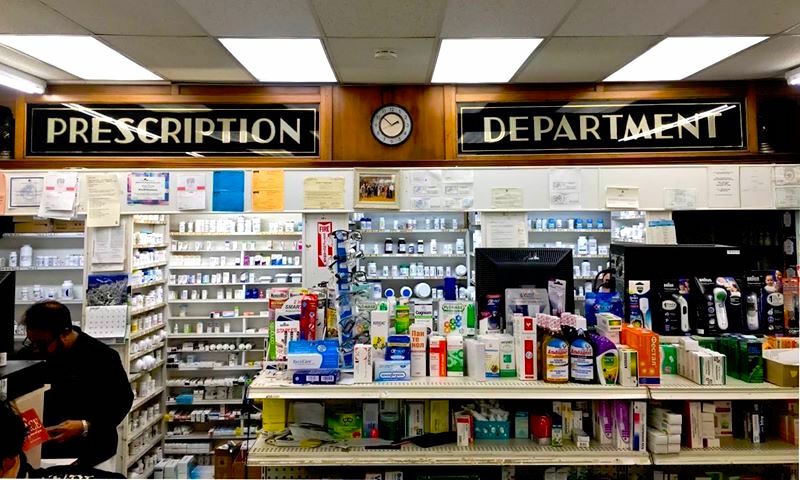 The website says this pharmacy has been run by the same family since 1992. 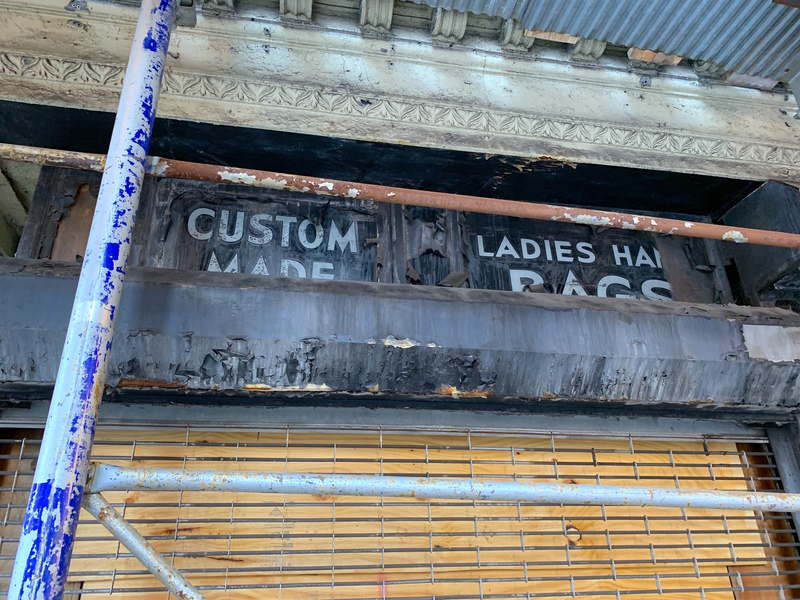 But based on the gorgeous neon sign that casts a lovely glow at York Avenue and 79th Street, I wonder if the store has been there a lot longer. 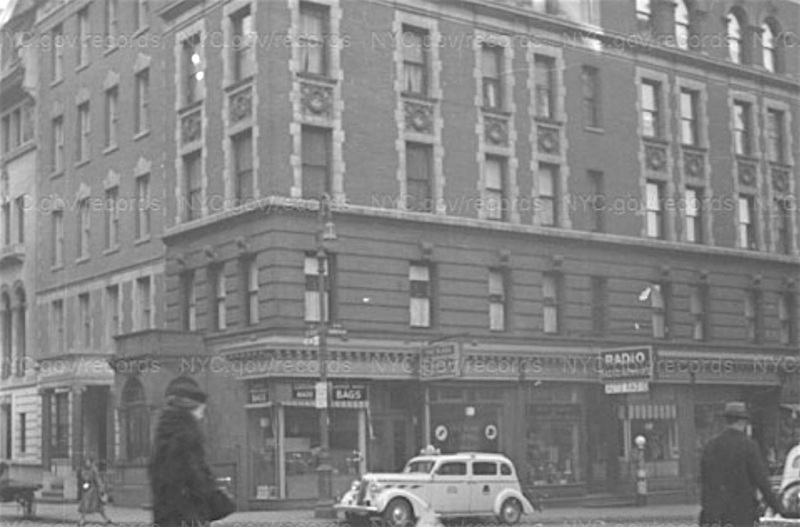 Also in Yorkville on First Avenue and East 65th Street is Goldberger’s, in business since the Spanish American War. 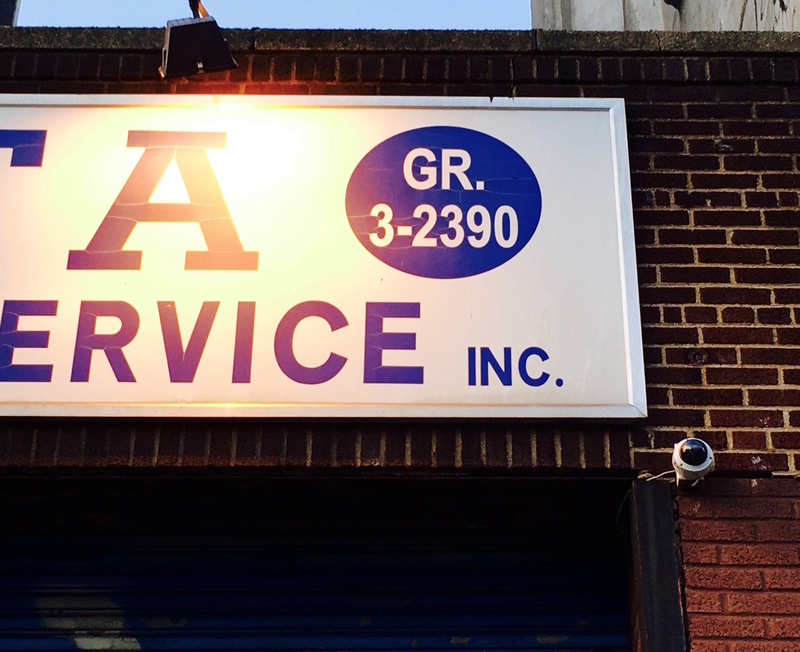 It’s the signage on the sides of the store, however, that make me feel like I’ve stepped into a noir. 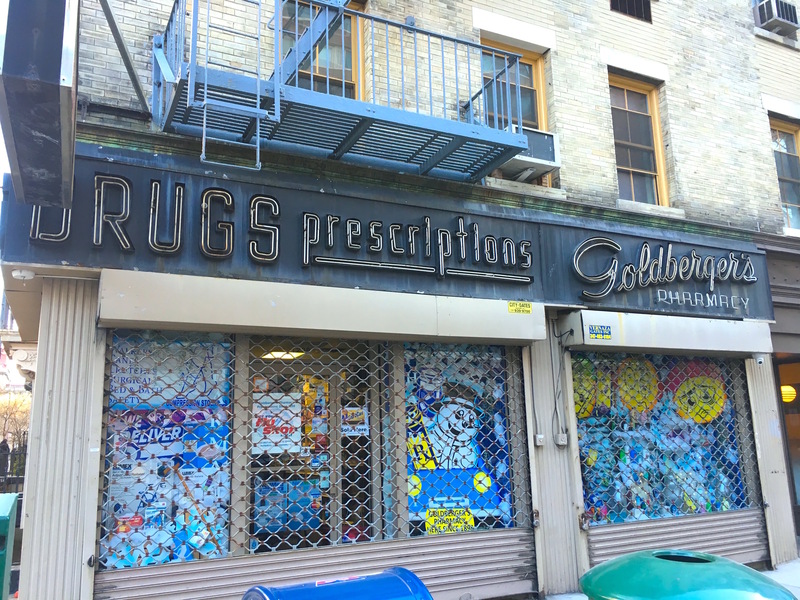 Cosmetics, drugs, prescriptions…and then the fanciful Goldberger’s lettering, in script. New York drugstores had everything. 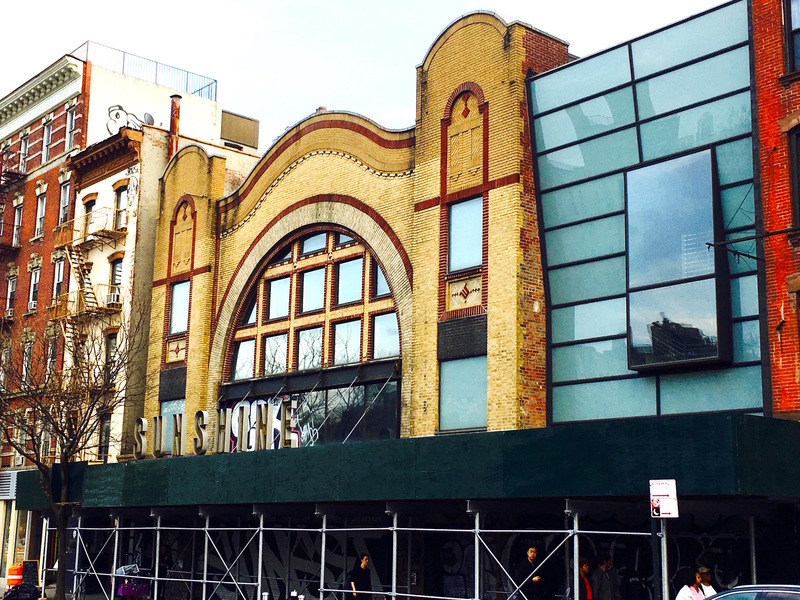 Now if only this sign still lit up in neon!